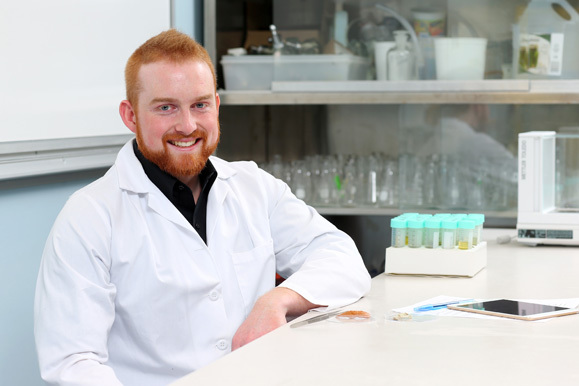 A native of Wallace, Nova Scotia, Brad Elliott is a recent graduate of the Faculty of Agriculture returning to campus to pursue his Masters degree alongside Dr. Sarah Stewart Clark. Brad’s work is part of newly- funded projects with Dr. Sarah Stewart- Clark through the Schulich Ocean Studies Centre Initiative. The funding allows for collaboration between ocean researchers at Dalhousie University and the National Center for Mariculture in Eilat, Israel. In partnership with Dr. Noa Shenkar at Tel Aviv University in Israel, Brad’s project will examine invasive tunicates. “I’m looking forward to this project for a number of reasons and to travel to another part of the world to collect data is the icing on the cake,” said Brad. "Being able to study at the AC on a project like this is absolutely perfect. I'll be working on the sort of project I've only dreamed about, with a group of very talented and like-minded experts." Brad and Dr. Stewart- Clark will be investigating molecular mechanisms that drive tunicate species invasions. Studying invasive species and how they operate is important to Atlantic Canada and abroad. This could make mitigation strategies more efficient within the industry by only focusing on the most aggressive genotypes of invasive species. Dr. Stewart- Clark is looking forward to having Brad back in the lab. Brad knows what to expect from this next chapter at the AC- hands on research and one-on-one interaction with students, professors and the industry. “During my undergrad at the AC, I got to work very closely with other students and professors and this interaction gave me a hands-on feel for what scientific research is all about,” Brad explained. One unexpected surprise, though, was the opportunity to conduct research in another country. The Dalhousie University Faculty of Agriculture’s aquaculture team is certainly making waves, both at home and abroad. Visit our Aquaculture Program Page for more information about Aquaculture at the Faculty of Agriculture.